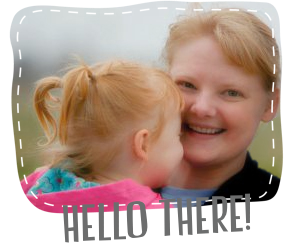 Good Golly Ginger: February Finishes! 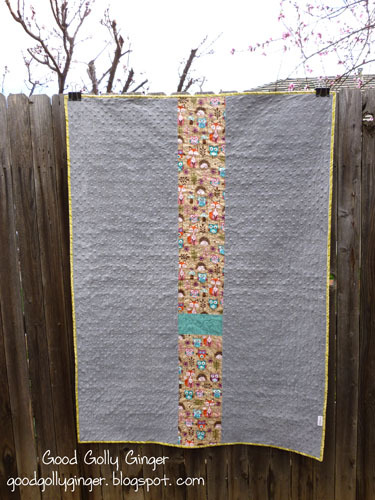 I designed two quilts in EQ7, a monkey and an owl quilt. It took the entire month to go from the design to finished quilts. Maybe I'm just a slow quilter, but life definitely gets in the way...field trips, Girl Scouts, dinner, taxes, ARGH! Can't there be more hours in a day to quilt?! I paper-pieced all six blocks. I love the owl. I tripped over the "Woodland Critters" fabric while shopping for extra sashing fabric on Etsy. With the hedgehogs, foxes, and owls, I had to have it! It ended up on the back, pieced together with grey minky. The back of the tag says Handmade by Katie Dold. These are so easy to make. I designed these quilts in EQ7. They measure 40" x 55". I free-motion-quilted in all-over loops and hearts. It's time to go wash them and ship them to their new owners. And now I need to clean my house. It seriously has not been cleaned this whole month! Don't worry, I do keep it sanitary, at least. As for A Lovely Year of Finishes, Yes, I did meet my goal for February. Congrats on 2 finishes! 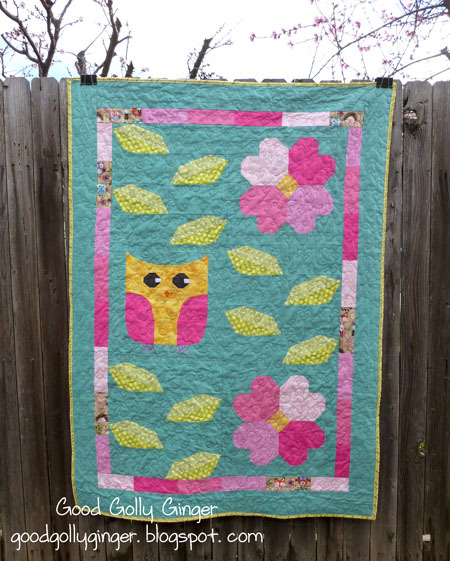 Love both quilts - owl and monkey. Isn't it a relief to get things done (on time)? What lucky babies, those are adorable!! how adorable are they! Amazing work designing them yourself, I hope you're really proud as you should be. I think 2 quilts in a month is incredibly quick! I am most proud of the designing part. These are my first actual quilt designs on eq7. Yeah, I'm really proud of these. :) Thank you so much! I sure think so too! Thank you for stopping by! Agreed! Thank you so much for stopping by! Those quilts are adorable. Bet they receive lots of loving! I'm sure they will...Thank you! 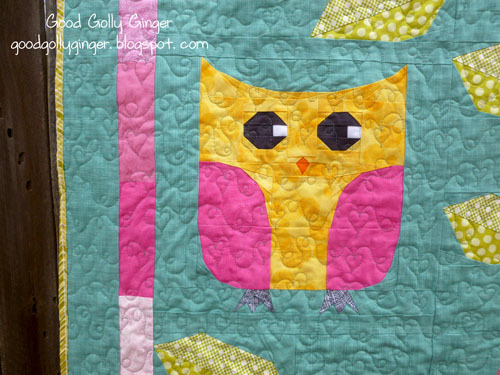 Wow those are 2 amazing quilts love the owl. 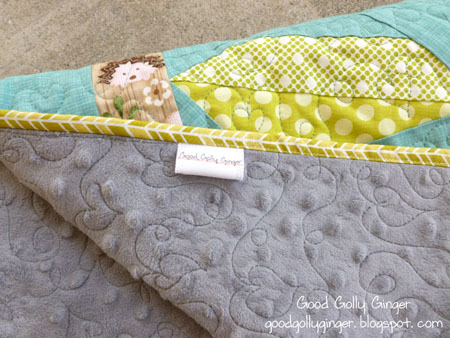 Both quilts are lovely! I think the quilting on the owl one is perfect - reflects the heart shapes of the petals beautifully! I can't believe you designed and completed both quilts in a month, and a short month at that. You are amazing!! Congrats on your finishes - they are adorable!! Thank you so much! I hope you have a lovely day! oh goodness! The owl is just as cute as the monkey! Fantastic! Than you for hosting Needle and Thread Thursday! And thank you for stopping by too!